It might be hard to believe that Howard Days starts in one week, but hear us now and believe us later! For all you lucky attendees, here are some random yet helpful reminders about coming to The Best Two Days in Howard Fandom! There are still seats available for the Friday night Celebration Banquet. You can Paypal your $15.00 to Projpride@yahoo.com, or check with Arlene in the Gift Shop at the House on Friday. We've moved the Banquet to a larger facility, the Family Life Center at the Baptist Church on Main Street. You can also bring Silent Auction items to the Museum on Friday if you like. The earlier the better. Right now we've got 130 items plus, including some rare REH collectibles. There are also tables still available for the Dealers Area. $25.00 for both days for your REH/related items, payable in the Gift Shop. Speaking of money, please remember that the Museum Gift Shop and the Silent Auction can only accept cash or checks. So bring your checkbook or hit one of the several ATM's around Cross Plains. The Postal Cancellation Souvenir only happens on Friday, so be sure to get up to the Cross Plains Post Office for this unique memento. 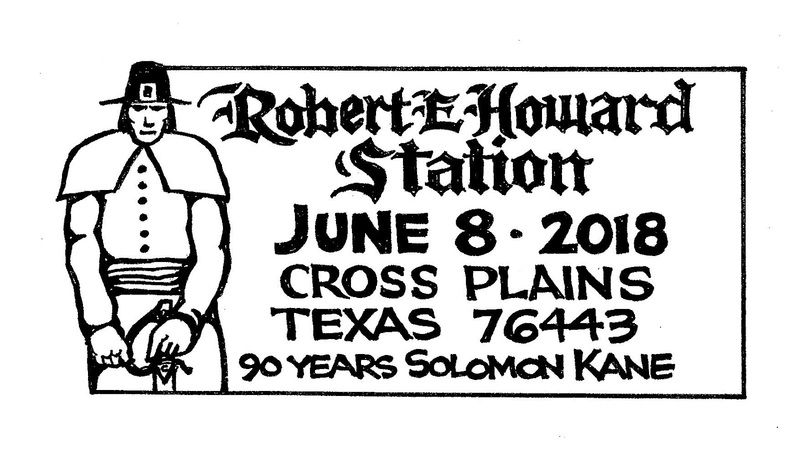 The Robert E. Howard Foundation Press will set up under their shady canopy, selling pure text REH. Their latest release, PICTURES IN THE FIRE, will debut there, with Editor Paul Herman and cover artist Bill Cavalier available to sign your book!. Skelos Press will also be on hand, debuting the English version of Patrice Louinet's THE ROBERT E. HOWARD GUIDE. The handsome Frenchman will also gladly sign your copy! The Conan Role-Playing Game will be presented at the Cross Plains Library along with the Conan Board Game and a little bird has told us the new Solomon Kane RPG will be on display. Here's a health reminder: The weather forecast for Cross Plains next week calls for hot as the slag heaps of hell (as REH would say) temperatures in the 100's. Consequently, dress accordingly, use sunscreen and make sure to stay extra-hydrated. Free water is available in the big cooler at the Pavilion, so everybody water up! In a related vein - Cross Plains is perpetually under a BURN BAN. The hot Texas air makes everything susceptible to fire, so PLEASE be very careful with matches or smoking. Finally, we will celebrate the 90th birthday of Solomon Kane with CAKE at the Friday Hot Dog Lunch. Cutting it with your rapier is optional. There may be more reminders as we think of them. Stay tuned to this blog or the Facebook page for updates and additional pertinent info. And remember: all the activities at Howard Days: Tours, panels, Hot Dogs on Friday and the BBQ on Saturday are free. Everyone is welcome, so y'all come! See you next week!